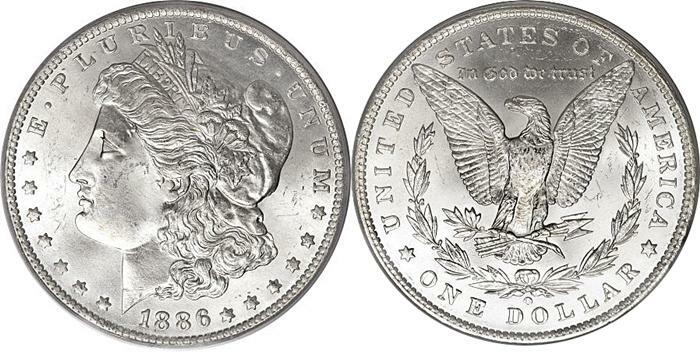 Many collectors know little about the design elements of a Morgan Dollar. It understandable since 1921 was the last year Morgan Dollars were minted, but there are a few elements of the design, along with a bit of history that collectors should learn about in regard to this very popular U.S. Coin series. Morgan Dollars are the most popular coin to collect because of the amount minted. However, there were several historical instances when millions were melted by the US Government for their silver content, and some like the 1884-S were mostly circulated, causing some dates and mints to become scarce in uncirculated condition. Of course, there are low mintage examples like the 1893-S and the 1894-P which are considered 'key dates' of the series. Another aspect that has helped the popularity of this series is VAM attributions. A VAM is an acronym for Leroy Allen and A. George Mallis who were numismatic authors and researchers. Together they discovered many Morgan varieties, or slight details and differences in the die strikes and design elements of each date. VAM collecting is a very popular, and sometimes lucrative, cherry pickers dream. It's another reason a coin collector should know the nomenclature of Morgan Dollar design. By nomenclature, I mean the names of various parts or design elements of the Morgan Dollar. Many Morgan Dollars demand large premiums in the higher grades or with VAM attributions, so buyers should be wary of most grading companies or dealers that place the highest grades on the silver dollar. Use only highly recommended grading companies to grade, authenticate and attribute your coins. If one is seeking a raw or ungraded example in a high grade, the first thing to look for is the absence of contact marks on Liberty's Cheek, then the absence of contact marks in the fields surrounding Liberty's Head. It needs to be noted, that most Morgan Dollars will have contact marks in these areas from banging against other coins in the mint bags, and the least amount of these marks a coin has, the higher the coin will grade. Also, the coin will not have any wear on the highest points of the design. Sometimes a coin will have roll friction or be weakly struck, so it takes practice, experience, and advice (from other knowledgeable collectors), dealers, and maybe a few submissions to a top tier grading company like PCGS to learn the differences in grades and grading. If you collect or decide to collect Morgan Dollars, or any coin, make sure you ask questions, check people's reputation, do research before purchasing these often over-graded and misrepresented silver dollars. 1900-O Die Break through date. If you like Morgan Dollars then you should check out our Morgan Dollar images by date and mint where you can also see images of VAMs and values for each date and mint mark. 1878 7/8TF Reverse Of 78', 2nd Rev.